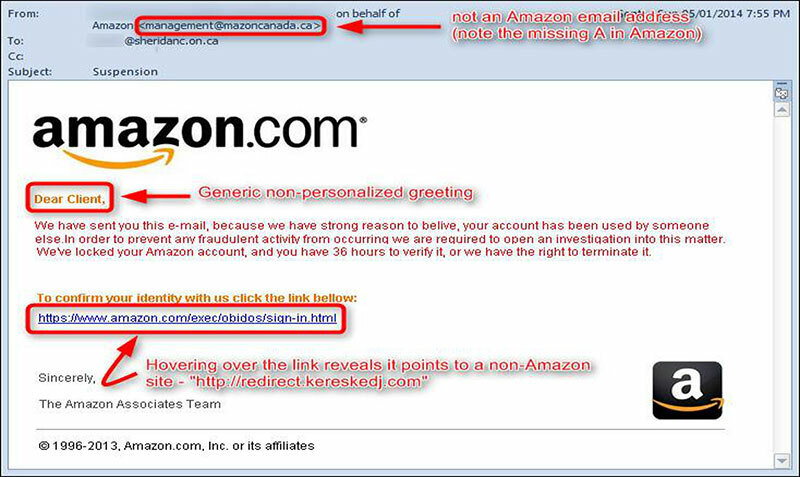 We’ve all received them – scam emails. Unfortunately, there are people in our communities who have fallen victim to scams. Today, GilaValleyCentral received the email shown below. This one was a little harder to detect than most, but not much. Typically, we get scam mail from somebody pretending to be from FedEx or UPS. You’ve probably gotten those too. They even have a pirated logo but the email address is from a private account like gmail or yahoo. Usually, they just have a button to click to track your package. When you click the button, they most likely infect your computer with malware and collect all your private information stored on your computer. It takes about 2 seconds to see that this is not a legitimate business proposal. Let’s start at the top. The email was sent by Martin William. The name was the first tip that it’s fraudulent. The typical American surname would be Williams with an s. Normally I would have just trashed this piece of garbage but for the sake of this article, I did a little research. A Google search for the name Martin William, produced a handful of results, but all for Martin Williams with an s. There was one listing for a Martin William, M.D. but when I clicked on it, the doctor’s name was actually William Martin. Next, I checked the website address of the email: globalmarketing.net. It doesn’t exist. There is a website called, globalmarketing.com, but they don’t do what Martin William is proposing. The email was sent to sports@gilavalleycentral.net. That is not the primary email address listed for communication. That’s used to submit sports information to the website. That email was captured by bots trolling the Internet to harvest email addresses. Notice that the name William in the email is spelled with a lower case ‘w’ both times it appears. Who makes that mistake in a business email? Somebody who’s native language does not use capital letters, perhaps? So, here is a guy named Martin William from a company that provides writing services and he can’t even compose an email on a sixth-grade level. “I think that you’d be a great addition to our inventory,” he says. Apparently part of the deal is that GilaVallleyCentral will become part of Martin’s catalog of items that they house in a warehouse somewhere. In my experience, most Americans don’t sign their correspondence with “kind regards.” I have, on occasion, seen emails signed with ‘warm regards,” but in every instance that I’ve seen, “kind regards,” the email has been fraudulent, written by a somebody who does not know the English language very well. The offer seems safe enough, right? This guy named, Martin, with a surname that doesn’t exist in the English language wants to put relevant and non-promotional content on GilaValleyCentral, and he’s going to pay us through Paypal or Payoneer for the opportunity to place these articles on the website. 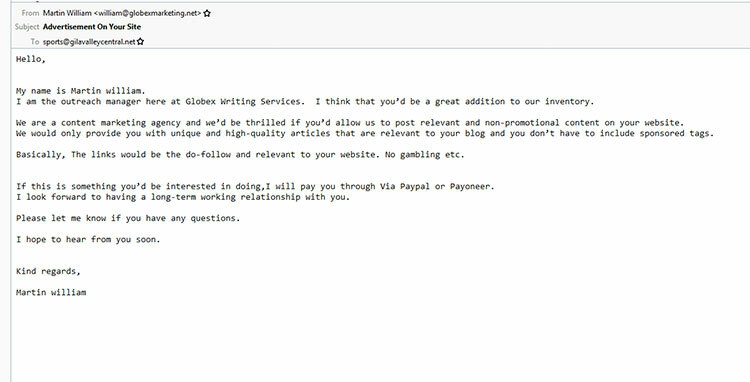 Martin is going to send some high-quality articles for publication on the site that will most likely link to fraudulent offers. When people click on the button they’ll either be taken somewhere that will take their money and send nothing in return, or infect their computer with malware. They’ll send us another fraudulent email pretending to be from PayPal, telling us that they’ve deposited money in our account. The email will have the PayPal logo and it will say, “You’ve been paid.” The email address it comes from, however, will be something like, sPfrq7@gmail.com or paypal@noname.com.